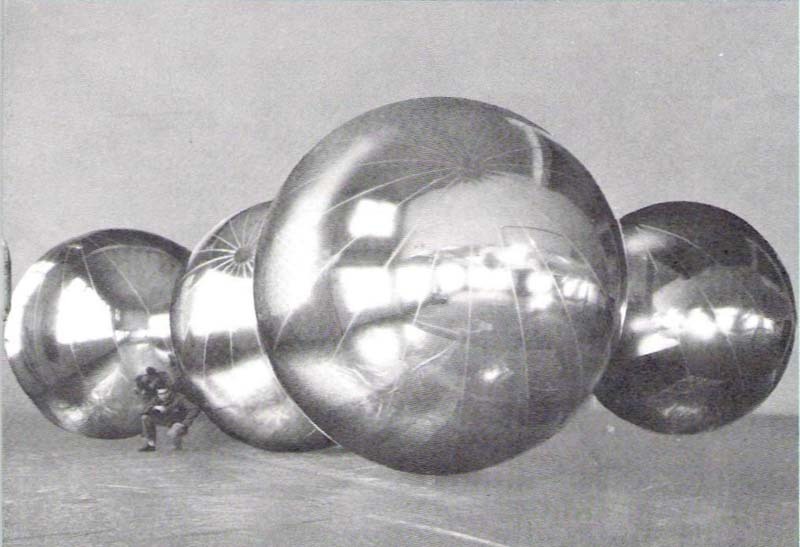 These radar calibration reflector spheres have been manufactured since the very earliest days of Raven Industries and Aerostar International still manufactures them today. -The Mars Pathfinder airbag system was designed to protect the lander regardless of its orientation upon impact with the surface of the planet. The system also was designed to handle lateral movement as well as vertical descent. -The result is a robust system capable of landing in rugged but scientifically interesting locations at Mars. 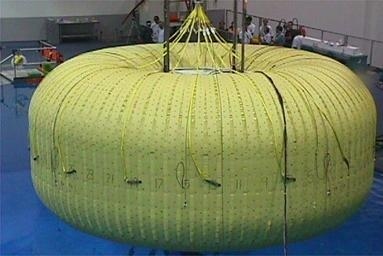 Development of the airbags required significant design and test work, but the qualification program for the system was completed in April of 1996, 8 months prior to launch. 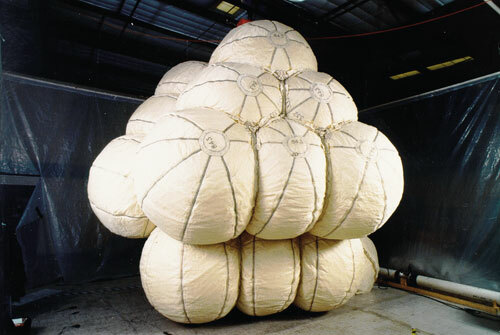 Creator/Photographer: NASA 1995 Engineers test huge, multi-lobed air bags, which will envelope and protect the Mars Pathfinder spacecraft before it impacts the surface of Mars. 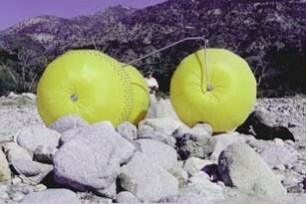 The air bags, manufactured by ILC Dover of Frederica, Delaware, are composed of four large bags with six smaller, interconnected spheres within each bag. The bags measure 5 meters (17 feet) tall and about 5 meters (17 feet) in diameter. As Pathfinder is descending to the Martian surface on a parachute, an onboard altimeter inside the lander will monitor its distance from the ground. The computer will inflate these large air bags about 100 meters (330 feet) above the surface of Mars. ILC Dover is the same company that manufactures spacesuits. -Unlike many other early space station concepts, this design actually made it out of the concept phase and into production, though no models were ever flown. This particular station was 30-feet and expandable. 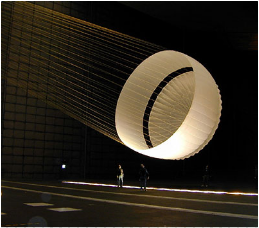 It was designed to be taken to outer space in a small package and then inflate in orbit. The station could, in theory, have been big enough for 1 to 2 people to use for a long period of time. 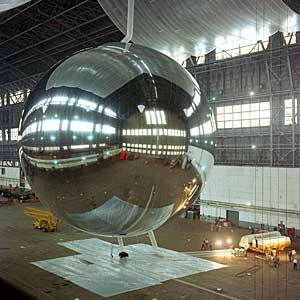 A similar 24 foot station was built by the Goodyear Aircraft Corporation for NASA test use. The concept of space inflatables was revived in the 1990s. -On June 28, 1958, Charles Lundquist (right) gave a presentation on orbital trajectories at the Army Ballestic Missile Agency in Huntsville, Alabama to Hermann Oberth (left) and Wernher Von Braun (center). Von Braun was an active proponent of utilizing space stations as “base camps” to other planets and satellites. Hermann Oberth was Von Braun's mentor and was a pioneer in suggesting that space stations would be essential if humans wished to travel to other planets. Charles Lundquist was the chief of the Physics and Astrophysics branch within the former Research Projects Division at NASA's Marshall Space Flight Center. 2. 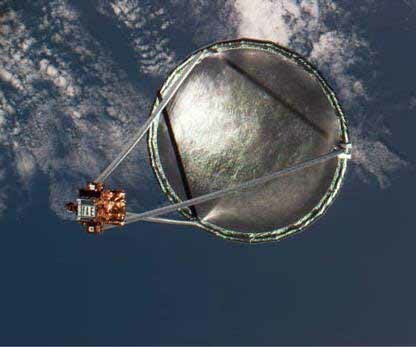 Polrad: “Moons for Future”, satellite as inflatable plastic bags covered with aluminum foil for reflecting radar signals. High above the Earth the Space Shuttle Endeavor launches a new type of instrument - an inflatable antenna. The officially designated Inflatable Antenna Experiment was released in 1996 as part of a Spartan satellite - which contains many scientific experiments. The antenna is roughly the size of a tennis court and is even visible from Earth. At the end of the mission, the antenna will be jettisoned while the rest of the Spartan is recovered by the Shuttle. The function of an antenna is to broadcast radio messages, and the large dish at the end helps focus radio waves into a narrow beam which can be detected over long distances. 3.et the most interesting space hotel right now is perhaps Bigelow's inflatable Space Station. Robert is betting 500 million of his own money on the project. If it works out, the Las Vegas Budget suites owner will not only be able to offer tickets at 8 million dollars,8 million dollars, or rooms at 1 million per night - but he'll build a chain…on the Moon, Mars - and beyond.